Today was a good day --- a rest day!!!! Less than 30 days until my Marathon. I'm feeling really confident right now and only a 20 miler to worry about. I feel I recovered pretty well from last weeks 20 miler and only took off one day after running that 20 miler and have felt great running all this past week. I think my foot hurt because of my old shoes so they have been retired with about 400 miles on them. Here's a couple pictures of my race shirt/bib for my next half marathon on Saturday. I am going to stick to my plan and run this as a training run. 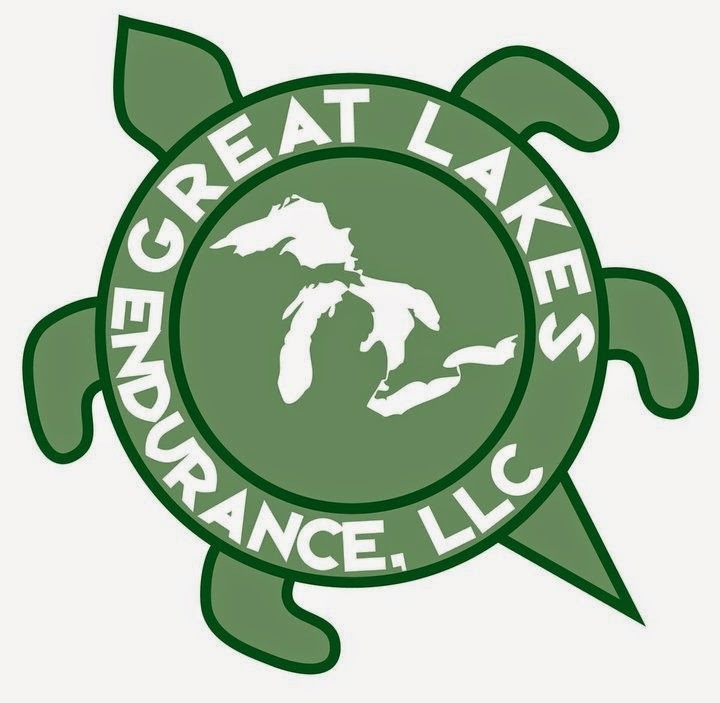 Now, I know I will likely run it a little faster than a training run but my goal is to finish under 2 hours which should be a comfortable run for me. No PR for this race as I want to keep my legs strong for the 20 next weekend. I really could use some more short sleeve tech shirts but I do use all my long sleeve ones and I do like having a white one. Cinch Bag - not bad. Not that I'm complaining(ok maybe I am) but it would be nice to get something besides a shirt. The bag is nice. I know at least I'll use it sometimes and I do use the shirts but need something different. 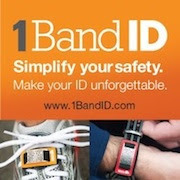 I'd like to see a nice big coffee mug(because I would use that daily), a key chain, socks, shorts, a hat, themed road id? ---- anything besides a shirt would be nice. 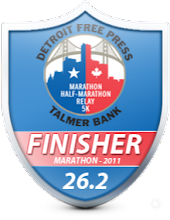 I'm going to buy myself a mug at the Detroit Half Marathon this year. You've got to really love it though since they're like $25 bucks!!! Question of the day? What have you received from a race that you actually use all the time? I didn't know we were getting a bag, too! That's exciting. 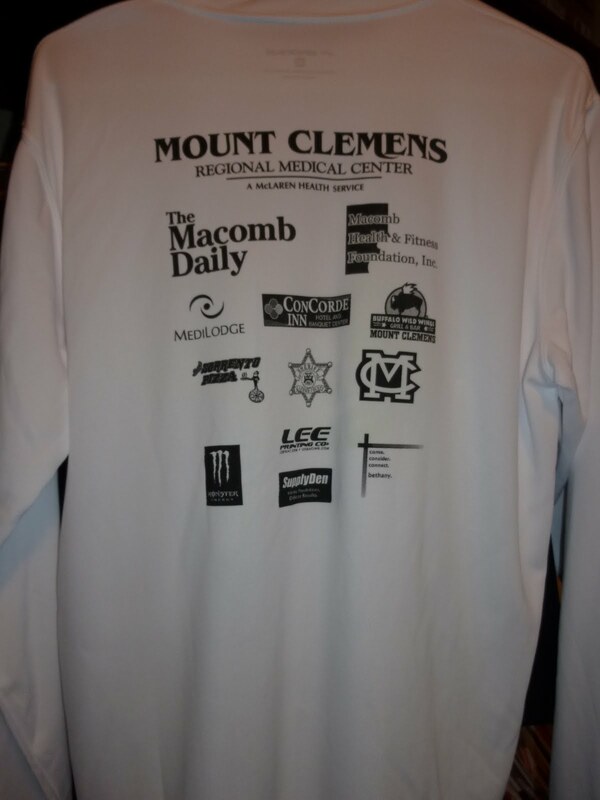 The only race shirt I have ever worn is my long sleeve from the Detroit Half last year. 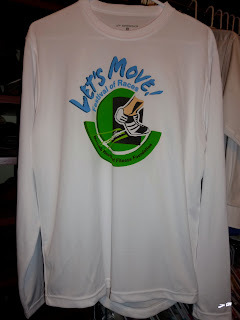 In fact, I'm bringing it for tomorrow if it's cold :) Other than that, all of my race shirts are in a drawer, never worn. I'll probably make them into a quilt someday or something, who knows. But I definitely can't get rid of them! I've never gotten anything else from a race that was fun, but I think socks is a great idea! I'll look out for you tomorrow morning! Good luck and have a great training run - don't push it! oooh a coffee mug would be cool! I do love the shirts, but only if they're technical shirts. The cotton ones I just donate because I'll never wear them. The bag is cool, I didn't know we were getting those for this race. That will definitely get some use. I for one though, love race shirts and wear them. Kind of bummed this one is a white tech shirt though. Not to be gross, but it'll probably get dingy/sweat stained. I probably won't actually run in mine to keep it in good shape. To answer your question, the Big Bird 10k in Roseville gives out gloves. I use them all the time! I wear my Chicago marathon tech shirt all the time. It's a great fit on me. In fact, if the weather cooperates, I am wearing it on Sunday for the trail half! oh, and good luck at your half!! I recevied a cinch bag from my 1/2 Ironman and I use it all the time. Of course, with bike rides they always give you water bottles and those are great because they also get used. Good luck at your 1/2 training run! I got a mug at a 5k in December and love it. I think gloves, headband, other stuff would be great to receive. So does this race you're doing really have a "child check?" !!! That's a cool shirt. Have fun at the race! I've received running gloves, beer mugs and beer glasses, wine glasses, caps, hats, bottle openers and even a small tree that I planted in my garden. The gloves I used until they fell apart. It is very wise to run a half before the whole marathon. I have always followed this plan and it worked all the times. But take it easy. Good luck at the race. I'm with you on a nice mug but$25? wow. Enjoy your race! Hope the half goes according to plan :) and smart to save the legs for that 20. 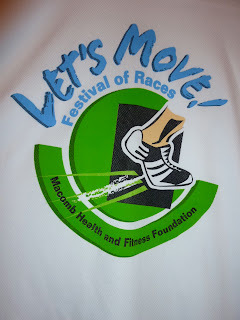 I use one race item... a long-sleeved tee from a race in 1996... lol. I wear it at the beginning of all chilly runs. Do you get to choose to check the child or the gear?